As we head to Charlotte this week for the second race in the Contender round, we have our work cut out for us. Even after the tire issues this past weekend at Kansas, that’s not a surprise to me. No one said this was going to be easy. One of the interesting things about where we’re at now — 10th in the overall standings — is that we’re two spots behind Jeff Gordon, who’s currently in the last slot to advance to the Eliminator round. It’s been like that with Jeff all year. Prior to the Chase, we finished 1 and 2. In the last three races that one of us won, the other driver wound up second. And if the 2 Team is going to keep going in 2014, we’re going to have get to at least where the No. 24 is now. That’s one heck of a challenge, too. WHOEVER WINS THIS YEAR’S TITLE IS GOING TO HAVE TO BEAT ONE OF THE SPORT’S LEGENDS. 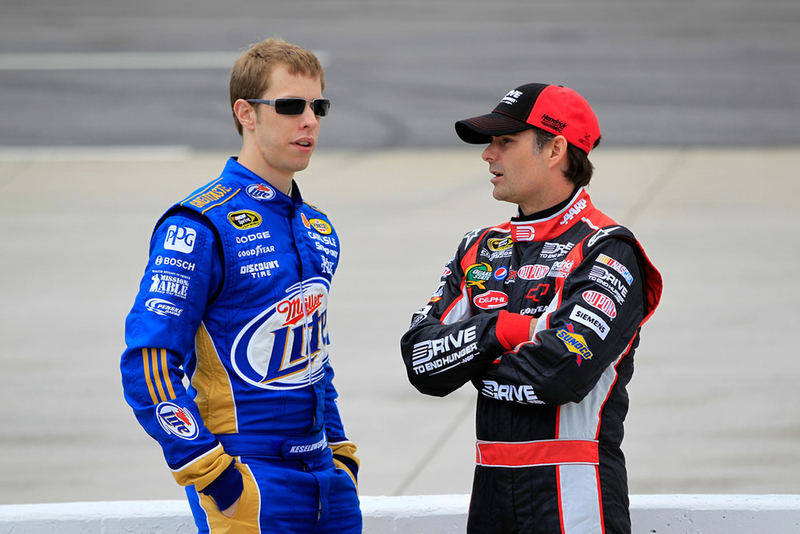 I got to know Jeff beginning in 2008 after I joined Hendrick Motorsports. The previous season, Jeff had turned in a career year, one of the best he’d ever had without winning the championship. His stats were amazing, among the best he’d ever produced. So he was at his peak in many ways, a legend. But as great as 2007 had been for Jeff, 2008 was exactly the opposite. It had been going terribly. Jeff had just come off of a race in Texas where he wrecked out on the first or second lap. In less than six months, he had gone from the top to the very bottom of the sport, which is not necessarily his fault. It’s just how the sport works sometimes. All hands on deck at the time trying to figure out what was wrong with the cars. I was one of them. It was sometime in the late spring of 2008. I was brought in to test one of his cars at Kentucky Speedway. After I got to Kentucky, I wound up riding from the airport to the track with Jeff. He asked me if I’d talked to Dale at all about the test. I told him. He laughed. There were a lot of issues with Jeff’s cars at the time, and everyone on Jeff’s team was pretty aware of the gravity of the situation. You could feel it. Certain teams in sports have a reputation of excellence, and when they’re not at that level, it affects everyone. Everybody is on pins and needles. On top of that, there was the added pressure of Jeff being a living legend. I’ll never forget the first time I got in one of his cars and drove it. The test didn’t go well. Still, the one thing I remember was the car itself. Jeff’s team was struggling so bad they didn’t have time to do test cars, so they were taking real race cars out to the track. Jeff’s car was just beautiful. It was almost like one of these collector cars, like a really nice million dollar collector car. But it was a race car. It was in full race decal and paint. The paint and finish on it were perfect. The detailing inside of it was perfect. I’d never even come close to sitting in anything like that before in my life. To that point, it was the nicest car I’d ever seen. I went on to win the race, which made the whole thing that much more special. 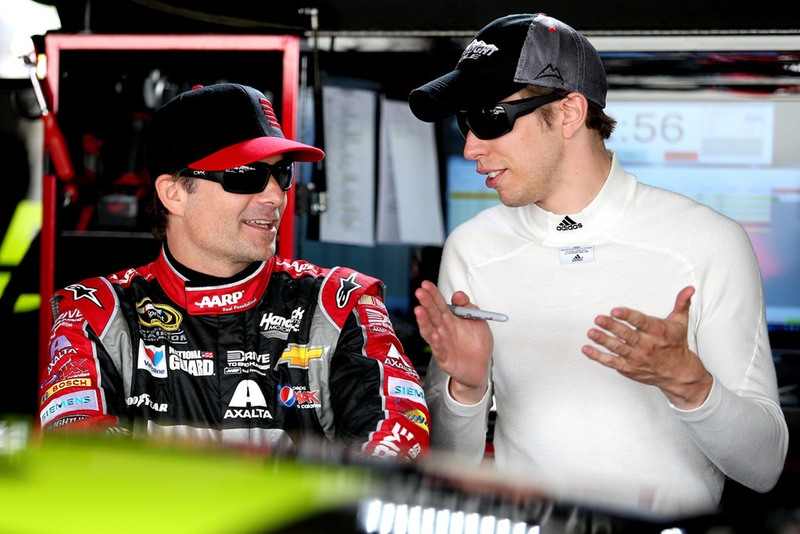 FROM THE TIME I ENTERED THE CUP SERIES, JEFF HAS ALWAYS BEEN A GUY I CAN TALK TO (GETTY IMAGES). In the time since, I’ve gotten a chance to know Jeff on and off the track. On it, as everybody knows, he’s just incredible. His skill set is very unique. Any of the tracks that require heavy braking, he’s just so good at, and that’s always stood out to me as being very impressive. He’s a very good braker. That requires incredible eye-foot coordination. He probably knows how to use the brakes better than anyone besides Marcos Ambrose on the Sprint Cup level. His success at Sonoma specifically has always stood out to me. That particular track is so difficult to get around, and he’s always so good there. And as you’ve probably noticed, Jeff’s superspeedway talents are pretty strong, too. He made this pass in the 1999 Daytona 500 that was a wow moment for me personally. He was running underneath Rusty Wallace (in the No. 2 car), but there was a slow car on the apron. Jeff literally pointed right at the car and somehow swerved around it at the last second to take the lead, and went on to win. It was a really gutsy and savvy move all at the same time. Off the track, Jeff’s like Tom Cruise in Days of Thunder. Height-wise, looks-wise, the boyish charm, everything. That’s who he reminds me of. In all seriousness, he’s really, really smart, thoughtful and savvy in a lot of different ways. His media savviness is on a whole other level, and has always impressed me because it’s something I’m always looking to get better at. He’s also just great with people. We know each other pretty well, but what’s funny is that Jeff makes it a point to know everybody pretty well. That says a lot about who he is, and how much he cares about the sport and his peers. He’s less reserved in person than he is in front of the cameras, someone who’s having a fun time and enjoying what he does. He’s more of a family man. Most people probably don’t know this, but there’s actually a lot of history between me and Jeff’s current team. A lot of the current No. 24 crew actually came from my Nationwide team at Junior Motorsports. It was set up that way on purpose because the team was supposed to move with me to Cup. Ultimately, things worked out differently, and I wound up moving to Team Penske, but I know most of the people on that team because we spent so much time together. I still consider many of them my friends. When I think of NASCAR, I think of the drivers that have dominated different eras. In the 1960s and 70s, it was Richard Petty and then Cale Yarborough. In the 80s, it was Darrell Waltrip, followed by Dale Earnhardt, who excelled through the mid-90s. Jeff Gordon took over for the late 90s, and since then, with a few exceptions, it’s been almost all Jimmie Johnson. Looking back at 2012, one of the most meaningful things for me about winning the championship was that I had to beat Jimmie to do it. I had to beat the most dominant driver of his generation, and I had to do it while he was driving his best. 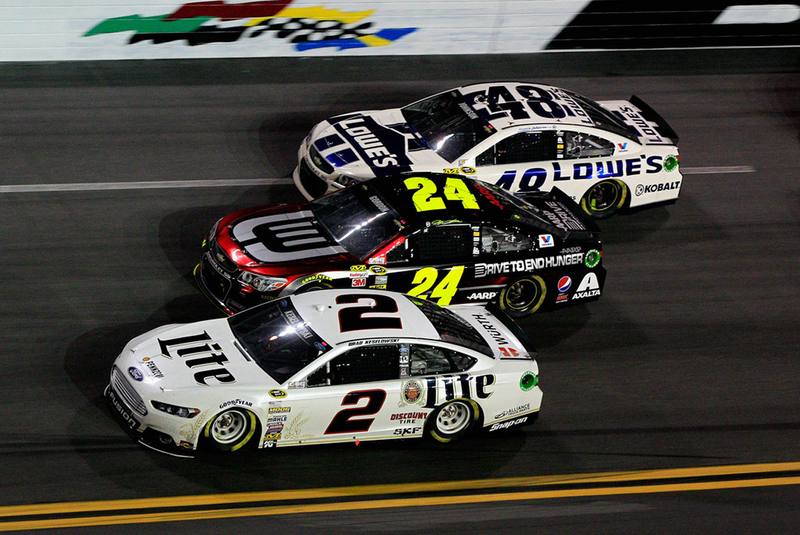 I TAKE GREAT PRIDE IN BEING ABLE TO RACE AGAINST TWO OF THE BEST IN THE HISTORY OF OUR SPORT (GETTY IMAGES). This year, the Jeff Gordon who owned the late 90s has returned. He has a win at every track. His cars are strong, he’s experienced, and he has a powerhouse team. He’s driving at his absolute best, as well as he did when he was dominating the sport. For the other 11 drivers left in the Chase, it couldn’t be more clear: It’s going to take our best to beat him. Brad that whole Texas deal with him, you were just racing for the win and that is how you are supposed to race. It’s good to see your one of the many few who still does race like that.